WeatherBest decking is the right choice, no matter how you imagine your deck. 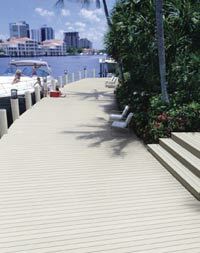 WeatherBest decking is always straight and true when you purchase it, never twisted or crooked. It cuts, drills and installs like wood, can go around radius curves and is resistant to warping, splitting and splintering. Easy to mistake for real wood, WeatherBest Select and WeatherBest Premium decking are available in comprehensive decking packages, including corresponding railing and fascia. Each package offers all the convenience of WeatherBest premium decking: no staining, no painting, no sealing. WeatherBest Premium decking offers a composite decking done in four breathtaking hues: Western Redwood, Pacific Cedar, Driftwood Grey and Tuscan Walnut. It just doesn't get any better than WeatherBest Premium. It's everything you could want in a decking product without all of the hassle. Exclusive reversible boards feature random graining patterns over boards embossed in our patented natural roughsawn pattern.. Some say it's the best of both worlds. If you're the rustic type, the natural feel of roughsawn wood is just the thing to satisfy you. WeatherBest Select offers the fabulous look and feel of natural wood in two wonderful composite woodgrain choices, Roughsawn Pine and Roughsawn Gray. All wood-composite products are expected to incur some weathering over time. You will see some color variation from the original color purchased due to this weathering process. The roughsawn process used to create WeatherBest Select produces random graining patterns, resulting in subtle variations similar to treated wood. But you'll know WeatherBest Select is truly a state-of-the-art composite because like all WeatherBest products, no staining, sealing or painting is required. 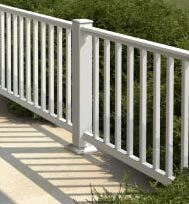 While WeatherBest Crystal White Railing resists most common household stains like oil and grease, they will become dirty like any other product that is exposed to atmospheric conditions. Chalk may also accumulate on the surface. This is a normal condition for all pigmented materials which are constantly exposed to sunlight and the elements. Soil, grime and chalk can be simply removed with the help of your garden hose and a bucket of soapy water. If especially stubborn stains cannot be removed with normal household detergents, request a cleaner from your contractor. Always test the cleaner on an inconspicuous area before full use. Mildew may be a problem in some areas. It appears as black spots on surface dirt and is usually first detected in areas not subject to rain fall such as under eaves and porch enclosures. For removal, prepare a solution as shown. CAUTION: greater concentrations may cause damage to the railing surface. Mix together: 1/3 cup detergent , 2/3 cup Trisodium Phosphate , one quart 5% Sodium Hypochlorite and three quarts of water. If the above solution does not readily remove the mildew spots, request a mildew-type cleaner from your contractor. The chemical agents referenced may be hazardous to the user or to the environment. Be sure to follow all precautions and warnings on product labels, and particularly those which may be necessary to prevent personal injury. Please dispose of these chemical agents in a manner prescribed by the manufacturer.